It's a Mom Thing Reviews & More! : Schoenhut Baby Classic Grand Piano Giveaway hosted by Growing Up Madison! 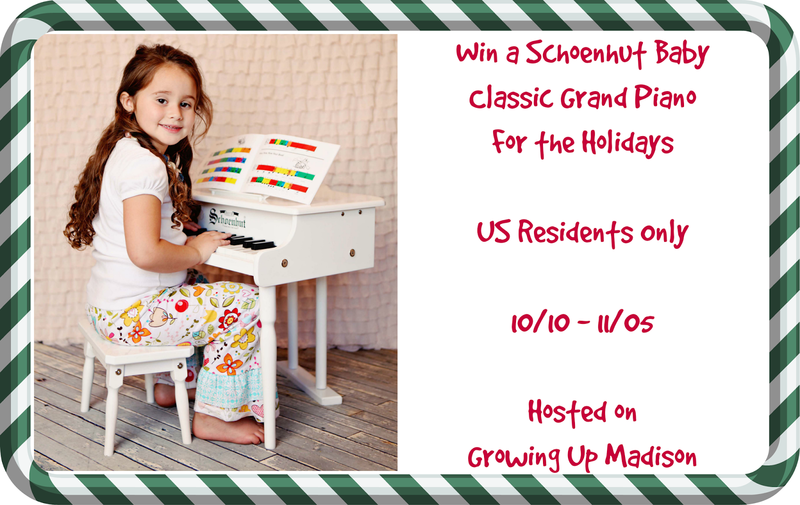 Schoenhut Baby Classic Grand Piano Giveaway hosted by Growing Up Madison! The Holidays are fast approaching and what's better than giving the love of music to your little one. Music inspires creativity and also helps with self esteem. The Schoenhut Piano Toy Company in collaboration with Growing Up Madison, is offering one of our reader the chance to win a Schoenhut Baby Classic Grand Piano. To read all about this Classic Grand Piano you can read Growing Up Madison's review. Winner will be randomly selected by PunchTab and will have 48 hours to reply to the email sent. Failure to respond will mean forfeiting your prize and a new winner will be chosen. Good luck! My youngest daughter will dance to anything & everything. !